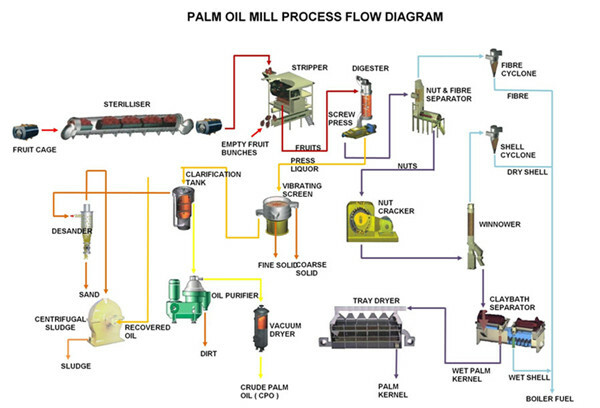 The above video shows the overall structure and main equipment of a large scale Industrial(commercial) palm oil mill plant. In general, the palm oil milling machinery used in large scale palm oil mill plant in Southeast Asia, are all like this video shown. Large scale palm oil mill plant is usually built near the palm oil plantation. Because of high lipase content, long time storage will make the palm fruit acid, which will influence the quality of crude palm oil. The complete large scale palm oil milling machinery includes a series of different sections, such as Fresh palm fruit bunches reciption section, Sterilization section, Threshing Section, Digesting & Pressing section, Oil clarification section, Palm kernel recovery section and so on. Collecting the ripe fresh palm fruit bunches from the plantation and transported by trucks to palm oil mill plant. Then pour the FFB into the discharge door after weighed by weighbridge. It is the beginning part of the large scale palm oil milling machinery running. The discharge door has discharging channels. Start the control valve to open the gate of the discharge door, then the palm fruits will fall into the fruit basket car or conveyor. Sterilization is a process, to inject steam directly into to sterilizer, then boil the palm fruit for about 60 mins. The purpose of sterilization is to break the enzymes in palm fruits and avoid the increasing of the FFA content in palm oil. Meanwhile, the high temperature will make the fruits soften, which will make it easy for palm fruit threshing and palm kernel cracking section. The purpose of threshing is to separate the palm fruit from the FFB. The drum type thresher is the common used in large scale palm oil milling machinery. The separated palm fruits are sent to the digesting & pressing section. Empty palm fruit bunches are transported to boiler room as fuel or to other place to further process. Digesting is for breaking off the palm fruit, and with high temperature to soften the fruit and kills the bacteria. The large scale palm oil milling machinery use double screw palm oil expeller, which is with hydraulic control system to adjust spacing between screws. So it is suitable for various palm fruit species and guarantee the oil yield. 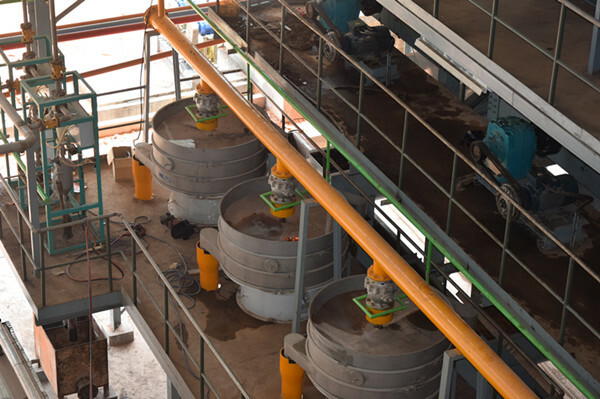 After pressing, the palm kernel and fiber mixtures are sent to palm kernel recovery section and the crude palm oil is sent to the palm oil clarification section. After clarification, the purified palm oil can be directly sold or deeply refining and the industrial sewage will be sent into effluent pond. Then the residual sludge can be used as the fertilizer. 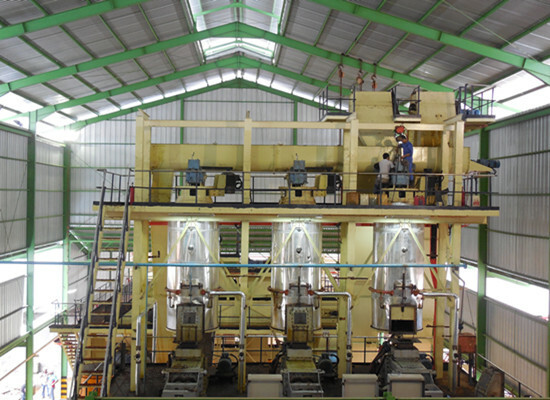 The whole palm oil milling process is high automatic, environment friendly and energy- saving. 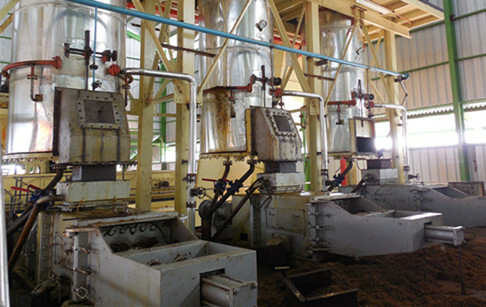 After pressing, the palm kernel and fiber mixture can be processed by further separation. After drying, the palm kernels are stored for deep processing, and the separated fiber and shells are used as the boiler fuel for providing steam. 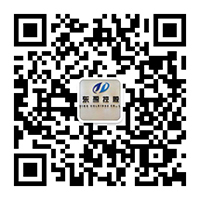 Henan Doing Mechanical Eqipment Co., Ltd is one of the leading manufacturers of palm oil milling machinery in China. Henan Doing Company's engineers have been studying the new technology of palm oil milling machinery. And Doing Company has 1-5tph small scale palm oil milling machine, which is our specially developed by engineers. No matter what you needs, Doing Company's engineers can design for you. Welcome to contact us! If you wanna to get more details about Large scale industrial palm oil milling machinery for sale you can send E-mail to market@doinggroup.com. You can consult our professional engineer and specialized sales team with leave a message in below form.We will contact with you ASAP.You also can visit our factory in Henan,China.Get Detailed address.